High Speed Data recording added to capture pedaling force (kgf) and torque (Nm) 64 times per second for post ride analysis (.csv format). the kgf column is almost exactly equal to the Nm multiplied by 0.6, so both only measuring the torque, not the pedal velocity.. so you cannot recalculate wattage..? There is no obvious way to tell the angle of the pedal.. so you cannot reliably visualise torque throughout the pedal stroke..? The raw pedal force or torque data are difficult to work with but you can extract some information from them. First, note that Stages mounts the strain gages (or gauges) permanently to the crank, so the crank length is constant and they know what it is; that means that there is a one-to-one relationship between the kgf and torque columns. 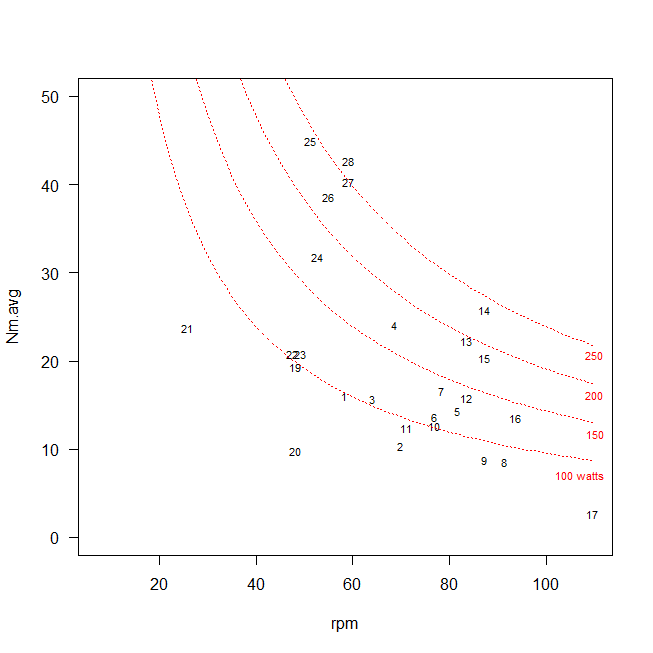 In this case, it appears from the given kgf and Nm data that your left crank is 170mm long. The data are not stamped with the crank position or crank angle but all is not lost: we can calculate the elapsed time between the peaks of the data. For those same interpeak intervals we can calculate the mean force or mean torque. Dividing the mean torque (in Nm) over each revolution of the cranks by the elapsed time over each crank revolution (in seconds) gives us the average power over each revolution in watts, since a Nm/s is a watt. Note that this will differ from the data usually reported since that is power over a second of time rather than power over a crank revolution. However, note that this is exactly how most power meters currently on the market calculate power: they average torque over a complete crank revolution, then divide it by the elapsed time for a revolution. Most (but not all) power meters currently on the market use a reed switch to determine when the crank passes by a fixed point. Thus, they know the elapsed time between closings of the reed switch and the position of the crank only once per revolution. In addition, although most power meters transmit data to the receiving head unit either once per second or sometimes at a nominal 4 Hz, they generally report the average power over the last completed crank revolution before the scheduled data transmission. How do we know that this is a valid approach? Below is a plot of torque and crank angle from Kautz's classic study of pedal force and crank torque. From this plot it is clear that the torque peaks only once per crank revolution. 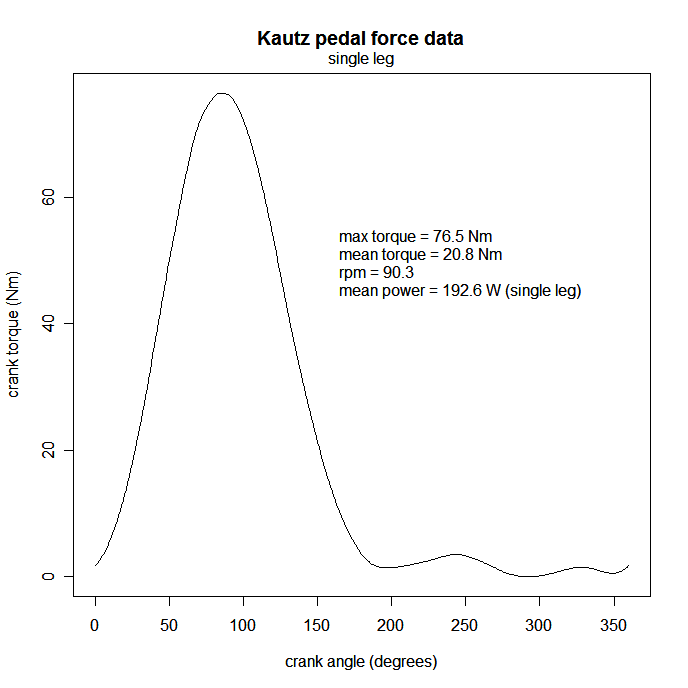 Note, by the way, that the Kautz data were collected from an instrumented pedal on only one crank, so the torque is measured only on one side, just as Stages collects only on one side. These data show that the assumption that the torque peaks observed in the data here also only occur once per crank revolution, even though we are plotting against time rather than crank angle. Importantly for this analysis, maximum torque is more easily identifiable than minimum torque. If you look at the first plot above, you can see that maximum torque is (in this sample) single-peaked but minimum torque can sometimes have a "blip" or other anomaly that makes identifying the peak-to-peak interval easier to find than identifying the trough-to-trough interval. Below I have plotted your data file with the x-axis converted from "Timestamp" to seconds of elapsed time and with torque (in Nm) on the y-axis. For each crank revolution I have done as described above and calculated the mean power in watts between torque peaks, presumably equivalent to crank revolutions. The average power between peaks is shown in red. Note that over one of the intervals the average torque as measured by the left crank was negative -- I have not suppressed or cleaned up the data so that shows up as -20 watts for the period from roughly 14 to 22 seconds on the plot (presumably, your right leg was generating positive torque at that point but we cannot see it). A slightly larger version of the plot below can be seen here. Note that other power meters (including the Garmin Vector, the Power2Max, and the new Pioneer, among others) use a combination of force-sensing strain gages and acclerometers just as the Stages does to determine force patterns and thus power. In fact, the Power Tap uses only strain gages and elsewhere I have shown that its "virtual cadence" estimated by variations in torque measured at the hub provide a reasonably good estimate of cadence as measured by a dedicated reed switch on the crank. Once again, this supports the approach taken here of using torque or force patterns as a way to determine time taken for a full crank revolution. Since we calculated the elapsed time for each crank revolution, we can also calculate the cadence (in terms of revolutions per minute). I had calculated 28 values for the power over the 28 interpeak intervals in the plot above. 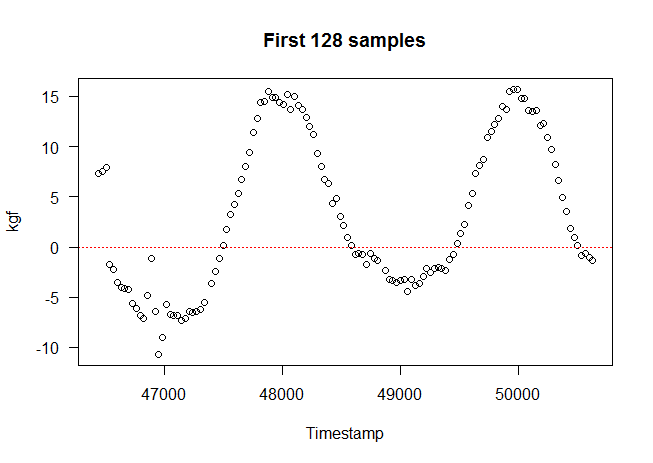 The plot below shows the cadence and average torque for each revolution corresponding to those 28 values, with the cadence and average torque pairs sequentially identified by a number from 1 to 28, indicating which crank revolution is shown (thus, the first combination of cadence and torque is labeled "1", the second by "2" and so on; the point with negative average torque is off the bottom of the plot). The dotted red lines are isopower contours at 100, 150, 200, and 250 watts. As can be seen from the plot, for the first 16 or so peaks, cadence was higher and torque lower than for the final few pedal strokes. 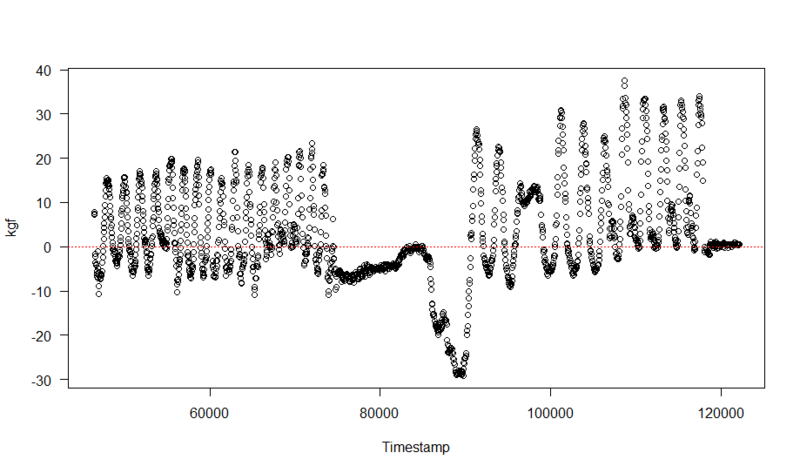 That is consistent with the first plot above of torque against time-stamp: you can see that the pedal strokes are farther apart and the torque peaks are higher. Thus, you can see that even without nominal crank angle, it is possible to reconstruct reasonable estimates of power and cadence from these data, tedious though the effort may be. If your data sample were longer you might want to pass the torque data through a filter to strengthen the "signal" and suppress the "noise," then difference the filtered torque values and look for records where the difference passes zero from above; this will identify a torque peak (this method is essentially the same as examining the first derivative of a function to identify transition points and then examining the second derivative to determine whether the transition point was a maximum or a minimum). Then you can calculate the elapsed time and average torque between peaks as described above to derive power and cadence. Is there a way to check that the cadence values derived in this way are correct? Not with only these data alone. However, almost all usual Stages data sets will include wheel speed. Wheel speed is typically measured by a reed switch (see this bicycles.stackexchange answer for a description of how speed is measured) and it is possible to use measured speed and estimated cadence to calculate the implied gear ratio. Except for the rare bicycles with continuously variable transmissions, gear ratios are discrete. That means that if you plot the putative gear ratio based on speed and cadence over time, they should fall into easily recognizable discrete rows rather than into a random scatterplot. As an example, below you can see calculated gear ratios based on speed and cadence from a ride. 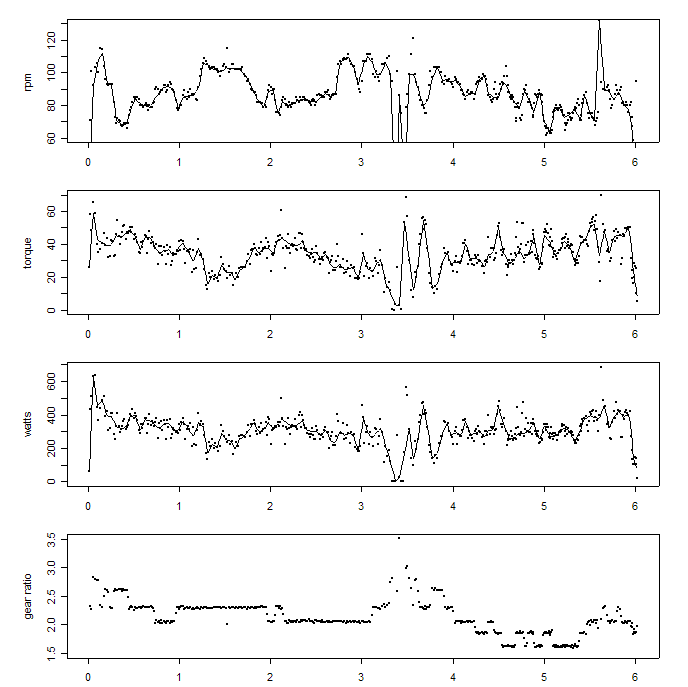 Unfortunately in this plot you cannot see the speed but the measured cadence is shown in the top panel, and you can verify that it is not constant but rather varies up and down. The bottom panel shows the calculated gear ratios and, as expected, they fall into discrete and easily identifiable rows. If the cadences estimated for the Stages high-frequency data were correct, the gear ratios derived from them would both fall into discrete rows and also would coincide with the gear ratios defined by the actual chain rings and cogs on the rider's bicycle. That would provide a check and validation of the method of estimating cadence from the peak-to-peak intervals. In summary, these data are not easy to work with but, evidently surprisingly to many, it is still possible to glean some information from them. In combination with other information that will probably be available from the usual Stages data files (speed and power) you could verify that this approach produced the correct high-frequency torque values to be consistent with the 1-second data. Then you could use the torque values to examine application of power around the pedal stroke with some amount of confidence that the data were complete and consistent. Negative force/torque power !+ actively resisting the pedal. Thus, no conclusions about pedaling "style" (even for the left leg, which is all that Stages measures) can be drawn from data such as these. I agree both are measuring torque/force. That is the ratio you would get with 170 mm cranks. 1 kgf = 9.80665 newtons. 7.3 * 9.80665 * 170 / 1000 = 12.2. But without pedal angle I agree you cannot calculate work or power (wattage). And this appears to be just one pedal. From there, the rest of the equation is standard physics. The average force per revolution (Fave) is measured by the strain gauges in kilograms and then converted to torque in Nm (Newton Meters) by multiplying it by the crank length (L) in meters and the gravitational constant (9.8m/s^2). Finally it is multiplied by the crank RPM which is converted to radians per second to derive the power. And I don't understand the number and magnitude of the negative numbers. Even when it looks like you were in a cadence your negative were 1/3 the positive. And in a stretch you have negative that are some on the biggest numbers. Not the answer you're looking for? Browse other questions tagged power technology or ask your own question. What does a cyclocomputer actually measure for calculating the speed of the bike? Can I fit a 105 crank arm (stages) to a Claris 2400 crankset? Has anyone else had problems with a Stages power meter at high cadence? Are there any bluetooth speed sensor with data logging ability? How can I combine Garmin recorded track data with FitBit heart rate data?